HIC-HLRN has just updated the HICtionary: Key Habitat Terms from A to Z. This reference work is the result of deliberation and debate across multiple specializations, regions and cultures within the membership of Habitat International Coalition (HIC). The purpose of that debate—and this reference work—have been to consolidate and harmonize understanding of the various terms of art confronted in the work of HIC and its Members in the fields of habitat (i.e., housing, land, natural resources, governance and sustainable development). Some terms include their Arabic-language translation or transliteration. This is an outcome of HLRN’s program objective to provide HIC services to civil society and HIC Members in the Middle East/North Africa region. It also reflects the practice since the first publication of HLRN’s bilingual publication, Land Times/أحوال الأرض, featuring a “Terminology Corner” of habitat terms used in each issue. The HICtionary is intended to be a living reference and subject for further debate and development of current terminology related to habitat. Your contribution to, and/or contestation of the terms and their definitions are welcome and encouraged. To contribute a term or definition, or to contest and definition in this edition of the HICtionary, please contact the HIC-HLRN team at hlrn@hlrn.org. 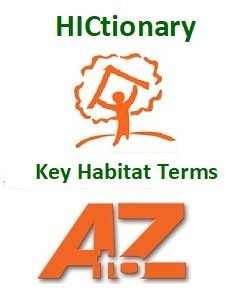 Download the HICtionary: Key Habitat Terms from A to Z.